With the imminent release of the next two waves, the number of possible commanders has increased for each side from 5 to 7. Today we will take a look at the new commanders for each side, and see what kind of strategies would synergize well with them. 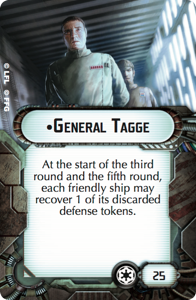 Just a single point over Motti, General Tagge comes to the party maximizing the utility you can get out of your defense tokens and as a direct counter to various ways of getting rid of them. Tagge will pair well with essentially any Imperial ship not named the Raider - if you have to Brace twice with a Raider, after all, it is probably dead anyway. But the Gladiator, particularly a Demolisher popping into the fight early on Turn 2 (or Turn 4) will appreciate being able to burn every token on defense, and have its Redirect and Brace back when it limps away on Turn 3 (or Turn 5). For other ships, the VSD and ISD both will greatly appreciate being able to burn their Brace token early and often to keep damage to a minimum, though frequently by the time they run out of Redirects, they don't have shields left anyway. The contain of the ISD maybe also something worth having back, and it allows for a Needa / TRC combo on either ship for long range firepower. For the ISD also, it lets you delay an activation of Devastator to the end of a turn, spending each token even if you don't need to on enemy attacks to throw extra Blue dice on your own, only to gain them back the next turn. For the Interdictor, Brace and Redirect can wind up easily spent on defense. Getting those back after an engagement could save a lot of trouble, especially the Redirect, as the Interdictor and its Engineering Value of 5 can mean a lot of shields repaired if you plan ahead with commands. The Gozanti also benefits, being able to toss Scatters to the wind, taking no damage, and getting them right back with Tagge. The trick to using Tagge successfully though is to time your attack. You want your attack to crash into the opponent's fleet during Turn 2 or Turn 4 to get the best benefit from Tagge's ability - this lets you go wild with defense tokens. On the other hand, you cannot afford to let that timing completely dictate the tempo of your game - that would make your play very predictable, and a skilled opponent will be able to see your plans and counter them. This I think will make Tagge a high skill commander, one to use with a good deployment advantage and a way to control the tempo of the game - possibly utilizing the new Interdictor to determine when and how the engagement occurs. Of course, that is something you should be working to do in the first place. The second-most inexpensive Imperial commander, Konstantine acts as a sort of "Super Tractorbeam" for your fleet, provided that you have medium and large ships to utilize his ability with. 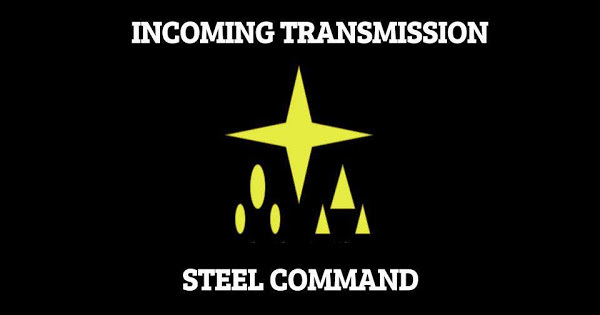 For the Imperials, this means VSDs, ISDs, and Interdictors. For talking about Konstantine we won't even touch on the other ships, except as fillers to a medium and large dominated list. What Admiral Konstantine does, he does very well. At the start of the Status Phase, each and every ship at 1-5 of two of your medium or large ships can have its speed increased or decreased by 1. That is a lot of control over your opponent's movement. The obvious use is to slow your opponents down so that they stay in your best arc longer, but that is not everything he can be utilized for. Speed an enemy ship up, and tractor beam away his navigate token (don't forget, they have to discard the token if they have one) to send him hopelessly out of position, either closing the gap to your waiting big guns or zooming out into the black void of space. Speed up the rear ship in a Rebel toiletbowl into a collision course with his leading friend, who you slowed to a crawl. Split up a fast approaching swarm into... some approaching too fast, and some hanging back. With the G8 Experimental Projector, you can ensure that even if your opponent has a navigation command set, he doesn't get the full effect. You could even use it to defensively, to force a normally long range ship to close range where your Targeting Scrambler can work. Personally, I think Special K here is going to be the sleeper hit of the Imperial Commanders for this wave. His ability, cheap cost, and synergy with Interdictors and Tractor Beams as a board control tool is just short of amazing. I see him countering a lot of strategies before they get off the ground. Again though, I think he is going to be a high skill Commander, like Tarkin or Rieekan, that needs a lot of thought and practice to get the best advantage out of him. 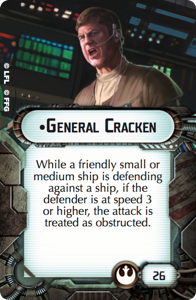 "The poor man's Mon Mothma" / "Admiral Monty on steroids" - Cracken is 4 points cheaper than the US National winning ship and comes with his own benefits and issues. The benefit he brings is that any medium or small ship that is at speed 3 or higher is obstructed. In a world where Special K (who we just covered) exists, this is... difficult to maintain. Not to mention Tractor Beams, Grav Wells, etc. Long story short he has counters, and he only works with small and medium ships. But how he works! If any of you have had the misfortune of trying to destroy and Admiral Montiferrat ship, it is annoying as hell to try and pull off. Plus, unlike Mothma's ability, his works at any range, and although it removes a die pre-roll instead of after the fact, it doesn't even cost any defense tokens to do so. Imagine him with the Mothmonition instead of Mothma - one less die, plus Admonition, plus evades on the approach. Certainly a better long-range defense, but a little bit less awesome at close. Where he synergizes best though is with ships sporting TRCs. Previously, if you went with Mothma and TRC spam you had to chose defense or offense with your Evades, particularly with single Evade ships like the Assault Frigate Mk2 or Nebulon B. With Cracken, they just need speed 3, no evade required, and as such are free to fire away. He also does good things with Medium Transports, particularly Bright Hope. One less damage and one less die can make a very weak ship very difficult to kill, especially if it is skirting the fight at long range. Overall, I would say that he is a decent option if you want to do a toiletbowl strategy, engaging at long range and high speed. He can be an okay option for hit and run tactics - long range to close, and then away at high speed. He is higher risk though, as Admiral Konstantine and Tractor Beams are a hard counter to him, and Gravity Well Projectors are a soft counter. 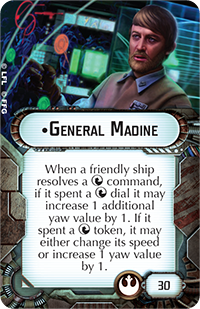 By far the most expensive officer of this group, General Madine gives your the option to increase your yaw by an additional 1 if you resolve a Navigate dial, and gives each ship an effective Nav Team, giving hem the chance to spend a token to increase yaw by 1 as well. Simply put, he makes everything turn on a dime. Now, CR90s don't really need him, outside of some ridiculous speed 4 near U-Turn shenanigans. Medium Transports are also fairly good in terms of maneuver charts. Where he will shine are with the Mon Cal ships. The MC80-C / MC80-A being able to make a hard 90 degree turn. The MC80-BC / MC80-SC being able to take 5 yaw at speed 3. MC30Cs becoming hyper mobile at speed 4. The Nebulon B also benefits from Madine's navigational boost, particularly at Speed 2 or with navigation tokens. Being able to turn hard if they find themselves out of position is something a Nebulon B has never been particularly good at, and Madine gives it that option. Even the Assault Frigate Mk II can benefit at either speed 2 or speed 3 from some extra yaw in turning a full 90 degrees. Often, that is enough to put a new shield facing toward your foe. Overall, I think he is a low risk, moderate reward officer - one that can be helpful for a new player that finds himself outdeployed and out maneuvered. 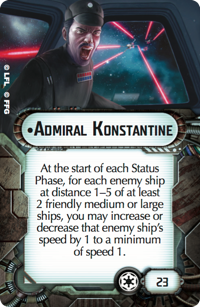 I also see him as a decent counter to the new board control options of Admiral Konstantine and Interdictors - hard to keep you from putting yourself in a good spot if you have a navigate set up and ready to go anyway. The other danger with him is that he is an officer that requires Navigation Commands to use his ability. You risk turning yourself into a one trick pony by going with him. Your opponent will be expecting Navigations, and you can get yourself into trouble by relying on them to the exclusion of other commands. That is all for Commanders. We should be covering the Wave 4 ships next time. Stay tuned!